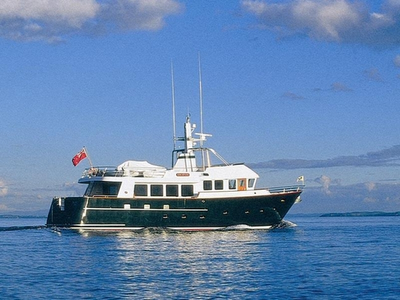 We are pleased to announce the addition of Luxury Yacht Escapade to our Fleet. Escapade is a 75 foot trawler style motor yacht with 20 feet of beam providing space and luxury for guests cruising the peaceful waters of the South Pacific. She has an open lounge for formal dinning and a relaxing cockpit where guests can enjoy outside living. Escapade has three well appointed guest cabins each with an en-suite. There are two outdoor areas; the fly bridge setup for sunbathing and stunning views and the aft cockpit with easy water access for enjoying kayaking, windsurfing, diving, snorkeling and swimming in the beautiful blue sea.